Today is the first day of the annual Florida ritual known as lobster mini-season. 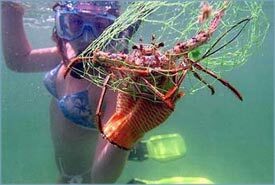 An estimated 30,000 people descend on the waters of the Florida Keys for this mini-lobster hunting season. Translation: This week is the opening of lobster season here.. A good time NOT to be on the water.. Lobster Mobsters from the main land come down.. run around drunk, run next to you while you are fishing, run over snorklers with out dive flags, run aground, drown, fights at the boat ramp, fights at gas stations, etc.. this is not a major exaggeration.. Several years ago 9 people died in the first 2 days.. no one last year fortunately..
More prop scars are created this week then the whole rest of the year..
May be we are just spoiled.. most of the year I see only a few boats a day while I am in the back country,, This time of year, some days none... Yeah, guess I am spoiled.. I am taking a quick trip to the Bahamas with some friends.. Will be checking and returning my emails daily.. Will be back Monday night after the mob has left.. Fishing here oscillates between good and tough depending on the weather.. Beautiful day here in the islands today.. Light east winds, lots of sunshine and a high of 90 degrees..